Come visit our modern showroom! Servicing of all vehicle makes and models! Get all your Vauxhall parts here! At Marness, we do not just cater for Vauxhall vehicles, we offer the same services for all makes and models including 4x4s and vans (up to 3,500kg). These include servicing, repairs, general maintenance, class 4 MOT, exhausts, tyres and batteries. We have a diagnostic machine that covers almost all vehicle makes. Courtesy cars are available on request, we have a collection and delivery service to/from Kirkwall and the surrounding area and also from the outer isles ferry terminals, or you can choose to wait in our comfortable waiting area while we look after your vehicle. Having your vehicle serviced regularly can help to maximise its lifespan and maintain its resale value, and also helps to identify faults before they develop into more serious problems. Please call our Service Department to book an appointment. Marness Garage is based in Orkney, just a couple of miles from Kirkwall. We offer a wide range of services including New and Used Car Sales, servicing, repairs, general maintenance, MOTs, tyres, exhausts and batteries. We can supply courtesy cars, and also offer a collect and delivery service to and from Kirkwall and the surrounding area, and from the outer isles ferry terminals. 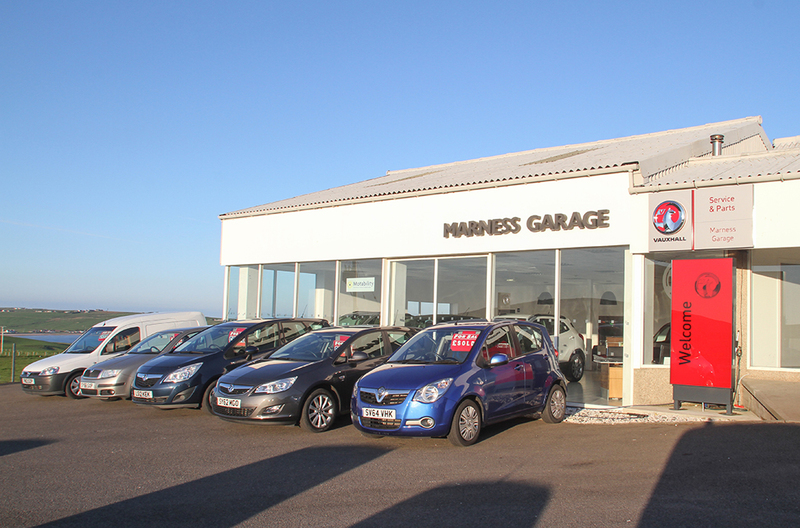 Marness Garage is the only authorised Vauxhall Service Agency in Orkney. We have invested extensively in the Vauxhall franchise including a modernised service reception area, training, and diagnostic equipment which enables in-depth diagnostics to be carried out on the Vauxhall range. You can read more about what we offer in the workshop section. We are also able to offer you new and used Vauxhalls which are currently available from Vauxhall or the Scottish Vauxhall website, including all promotions and special offers. Our sales team can source any make or model of your choice at a competitive price, saving you the hassle of going off the island. We are a motability specialist who can cater for all your needs. Please call for more details. The garage was founded in 1985 by James Dearness. Marness Garage carried out general motor vehicle repairs, servicing & MOTs. In 2000, it became a Renault dealership. Thirteen years later, in 2013, Marness became the Vauxhall dealership for Orkney. It is a family-run business, with Jimmy continuing to work alongside his son, James Jnr, and, his daughter, Tracey, who, along with other long-serving loyal members of staff, have many years experience in the motor trade and are committed to a high level of customer satisfaction.